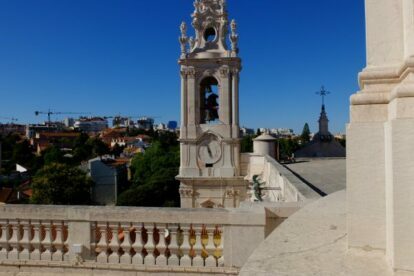 Aka “Royal Basilica and Convent of the Most Sacred Heart of Jesus”, the Basilica of Estrela stands proud on the top of a hill on the west side of Lisbon. With impressive baroque and neoclassic style, this church was ordered by Queen Maria I of Portugal as a promise for finally having a son to be heir of the throne. Unfortunately, the child didn’t survive to see the completion of the Basilica in 1790, but at least the city got to keep this wonderful catholic monument. There is a lot more about it on tourist guides, so my suggestion is just that you don’t miss an important part of the visit: the rooftop. For 4€ you can go up the spiraling steps and check out the 360º view at the top. You can also go into the beautiful Dome and look down at the church, but only if you don’t have vertigo, because it gives you big time butterflies in the stomach! The bells toll at each hour and every 15 minutes, and they also play complex melodies before mass. There are 12 bells, each one dedicated to a church figure like Saint Anthony or Saint Teresa, and luckily they are all original from 1788, having been restored and returned to the church in the early 2000s. Try and catch the sunset but be aware that it’s a bit windy up there. Afterwards you can always go for ice cream, coffee or a walk just across the street to another one of my favorites: Estrela Garden.